My work schedule has blown me away for a good part of the year. As unreasonable as it may seem I have only one window of opportunity for a wilderness trip. I can leave Edmonton on the afternoon of the 8th of September and I have to return to meetings in Vancouver that begin at 6:30 in the evening on the 17th September. If the timing works then I think we can have a fine time (without the joy of any bugs of the biting variety) in the Yukon from Sept 9th to Sept 17th this year. 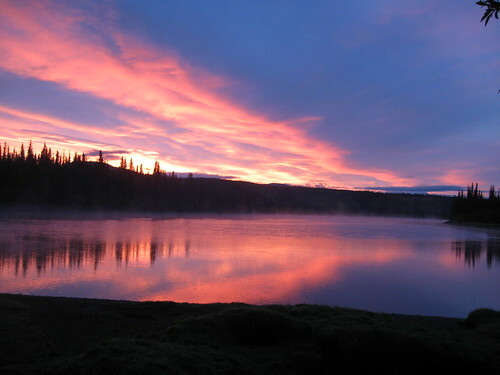 I am heading up to Whitehorse again on business tomorrow and will try to scope out essentials and good advice from those well disposed to me J in those parts concerning the Teslin River and the Yukon River. Within four days ten men had signed up including first timer Allan, a friend of Lionel’s, who volunteered to be head cook. Steven ordered a crudely produced but authoritative guidebook about the route by local guide Mike Rourke and posted several pages thick with detail. Its handdrawn maps indicating every riffle and possible campsite proved essential to our daily navigation. Converging from afar, our group assembled at Vancouver International at the check-in desk of Air North in the early evening, excited to meet again after a year and thrilled by anticipation, a cross between the Fellowship of the Ring and the Three Stooges. The hole left by the absence of Peter, who had bowed out because of a rib injury and family obligations, highlighted the sense of privilege shared by those who managed to get away. 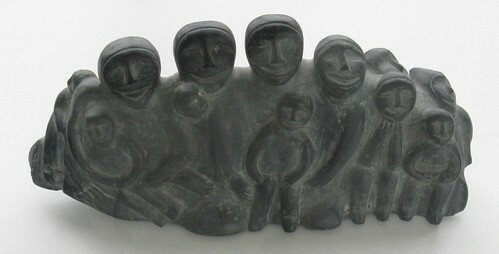 The wait in the terminal was enriched by a superb exhibit of Inuit sculpture. Landing in Whitehorse we were greeted by a welcoming face I hadn’t seen in decades: Noah C, whom I, Steve, Ian and Murray knew from Lund since birth, a friend of my son’s, whose parents had also come to live in the woods circa 1970. He lives there with his family, a teacher of elementary school, handsome, healthy and happy in the place where they say “Down in B.C.” He agreed to join us at our hotel for dinner. When we debarked from the airport bus in front of the Best Western Hotel someone in a group of youngsters loitering at the door asked if we were from Whitehorse and when answered no said, “You’re lucky, this place is a hole.” A few seconds later there was a crash of glass and the smell of gin, followed by a long series of howls as the kids lurched down the street leaving a broken bottle on the sidewalk. At our long table in the bar, we were also joined by Jonah, a cousin of John’s who lives in Whitehorse, and his partner Monica, two young people employed in the business of recreation that makes this place seem youthful and prosperous –he as a sponsored mountain biker and shop manager and she as a designer. To view a complete set of photos for this trip go here. To view a slideshow of these photos go here. After arriving in town separately on a late-night flight, Andy joined us for breakfast. Our outfitters, “Up-North Adventures,” ferried us around downtown Whitehorse in a van to shop for gas, groceries and liquor. 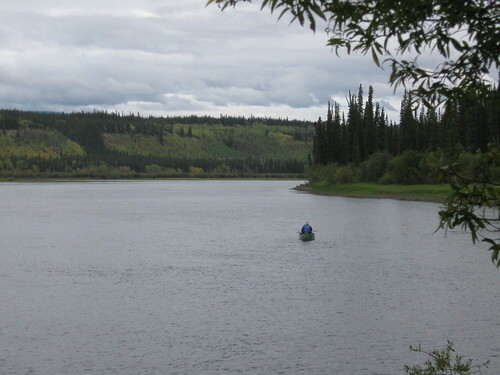 On the way to the supermarket, the boyish driver told stories of kayaking down class-five rapids in the Andes but assured us that the Teslin-Yukon was quite tame. Back at the shop we posed for a group shot. Midway on the two hour van ride to our starting point at Johnson’s Crossing, the Alaska Highway bridge near the head of the Teslin river, “His Oiliness” Lionel, the day’s elected leader, realized we’d forgotten to pack the two propane stoves we’d rented and asked the driver if there was any way they could be delivered to us enroute. 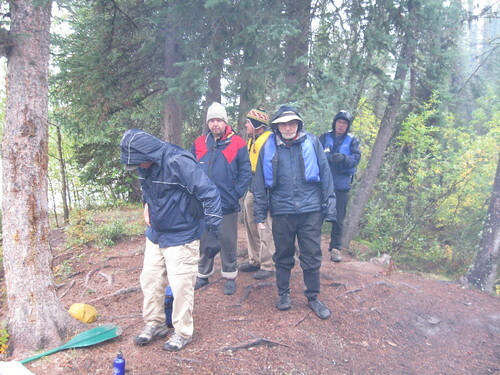 The rest of the crew displayed their manliness by pooh-poohing that notion and insisting we’d cook on open fires. In a darkening drizzle we loaded the boats and headed off under the bridge and around a bend away from the highway into what seemed like uncharted territory. I remembered that Andy had promised to bring a Satellite phone just in case. Even in the dead light, a margin of brilliant green grass lined the banks in front of a moving mosaic of dark spruce and luminous yellow aspen. The river was wide and the current swept us luxuriously downstream. As we packed all the food and anything attractive like toothpaste into the bear barrels, Andy offered a reality check after consulting the guidebook. In order to meet the outfitter 300 kilometers down river as planned, we’d have to cover 75 clicks a day, eight hours of paddling at the rate we were going. Taking into account an hour and a half each of set-up and take-down, there wasn’t much time for activities or exploration or fooling around. John the next day’s leader who named himself “Gone Fishin” called for 6AM wakeup. Andy got the fire going before yelling “Rise and shine” at the crack of dawn. Murray’s clarion call of “Where’s the f…ing coffee,” preceded pouring the brew which he lovingly percolated to supplement Alan’s multigrain porridge. Grunts and groans issued from several quarters, a result of stiff joints unaccustomed to sleeping on the ground or paddling and lifting. John was coming down with the flu, but insisted he’d tough it out. Murray recited the poem he had crafted about yesterday’s events, recalling forgotten incidents and giving the whole a memorable shape. Banter and storytelling delayed departure till 9:00 AM. The red sky at morning served as warning. On the river, the landscape grew more varied, at times opening to vistas of distant mountains pocketed with snow and carpeted with scarlet shrubs, at others unfolding high “cutbanks” of sediment carved by its meandering course into alluvial residues of sand and gravel left by receding glaciers. Distinguishing one from another and discovering the appropriate lunchstop and overnight campsite were officially delegated to the day’s navigator who carried the relevant pages of the guidebook in a ziplock bag. But this thankless office lacked authority and its holder was subject to complaint and disobedience throughout the trip. Within a couple of hours the temperature dropped close to freezing and it started to rain. Drybags were emptied of layers of waterproofing and insulation. There was no choice but to paddle hard without pause–both to meet our distance quota and to keep warm–fueled by handfuls from the huge bags of gorp distributed by our food providers. Finally at 1:45, John allowed us to pull over at a small campsite for a lunchbreak. 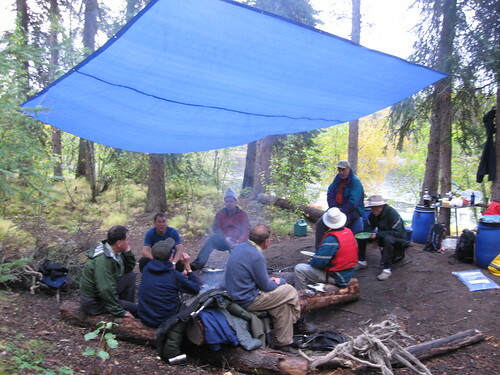 Gobbling rations of salami, cheese and cracker, men shivered around our small fire, and when it sputtered out in the increasing rain retreated under a tree. Back on the river, the rain lightened but we resigned ourselves to spending the rest of the day in wet clothes. 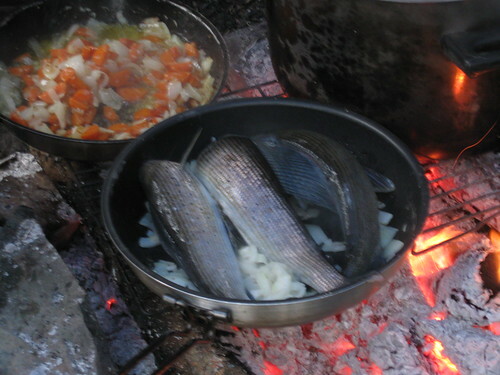 It was dark by the time we found the night’s campsite, but trolling from his canoe John had caught three arctic grayling trout to contribute to Allan’s piquant dish of riso pasta and curried canned chicken. Inspired by the cuisine, Ian our leader-elect took on the title of “Jobwaddhi” and offered deep spiritual counsel to his devotees in the accents of a maharishi, occasionally slipping into Scottish brogue. The dialogue was enriched in dialect mastered by several members of the group who had spent time in India or were in fact students of gurus. Substantial inroads into the rum ration and a sense of challenge overcome ended the tough day with satisfaction. Jobwaddhi made two sensible proclamations at breakfast: we would switch paddling partners and we would begin the day with stretches, a morning ritual that had been observed for at least the last two years’ trips and that would have helped get us through yesterday had it not been abandoned. 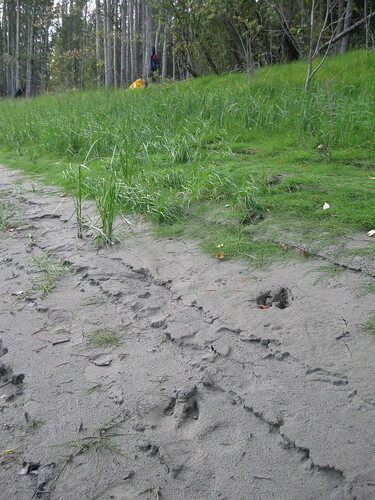 As we packed the gear, a large raven with a fat double chin perching on a snag in the middle of the campsite clicked and croaked with impatience to pick at our leavings Daylight revealed fresh tracks of bear, wolf and moose in the mud, but we were disappointed that no large non-human mammals were sighted any time on the trip. Bald eagles, both mature and juveniles were in plentiful supply, along with the occasional dead salmon lying on the shore or floating in the water, after migrating up from the Bering Sea into which the river emptied 1900 miles downstream near Nome Alaska. Three days from our departure point and cut off from other human contact, toughened by yesterday’s ordeal, familiarized with the recurrent features of the landscape, spared from rain though still deprived of sunlight, we had gained our riverlegs. The current varied from 3 to 6 km/hr with the exception of some faster water on hairpin turns and in reaches where the contour perceptibly dropped. At times steersmen faced a tricky selection of which channel around an island was least likely to run their canoe aground and threaten to swamp it in the strong flow. As they approached a junction trying to decide, they would often discover that the current had already chosen for them. On one occasion Steven and Ian found themselves making a 360 degree revolution while negotiating a swift section. On another Murray and John became marooned on a gravel bar off of which they had to walk their canoe, but this was as close to mishap that anyone came. Despite his worsening illness, John remained spirited and productive as ever. Several hours were spent passing through a burn where this summer’s forest fires rendered the tightly spaced black trunks into a dizzying moire pattern. The destination selected for the day had the alluring name of O’Brien’s Bar, but rather than an Irish pub it referred to an old settlement on a flat section of bank surrounded by a 270 degree turn of the river. With a surge of effort to fight a way out of the current, the canoes pulled up with a couple of hours left of daylight. People followed trails through the mossy forest which led to the ruins of a log cabin and heavy chunks of gold mining machinery manufactured in San Francisco, evidence of prospectors’ hopes and a long defunct paddle-wheeler trade. The catch of the day filled two large frying pans allowing each of us a generous portion. After dinner Ian and Steven did a tandem reading of Robert Service’s poem, “The Cremation of Sam McGee,” which takes place “on the marge of Lake Labarge” nearby. Each brought a copy, which wasn’t necessary, since this chestnut seemed to be printed in every tourist information pamphlet and engraved on many plaques on the streets of Whitehorse. 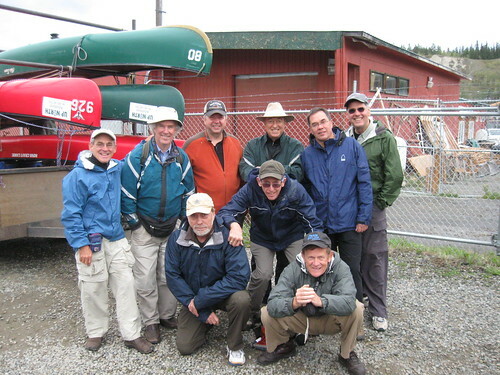 You are currently browsing the archives for the Canoeing the Teslin and Yukon Rivers 2009 category.